After 9 long months, the T/E School Board approved a new 2-year (2012-13 and 2013-14) contract between TESD and T/E Education Association last night. 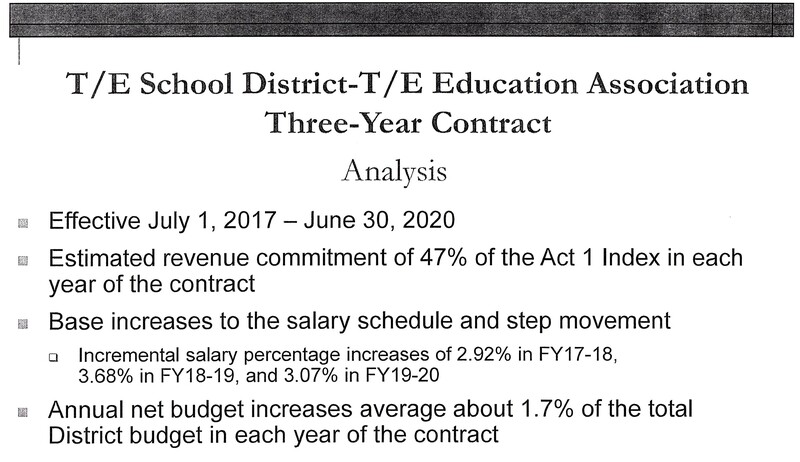 To read the contract summary of the teacher’s contract, click here. If you prefer to read the entire contract, click here. Ray Clarke attended the Special Meeting of the School Board and the Finance Committee meeting which directly followed. In his review of the teacher’s 2-year contract, I thank Ray for offering the following highlights and his personal commentary on the contract. As expected the teacher’s healthcare benefits and salaries are the primary focus of the changes in the new contract. The basic details are more or less exactly the same as the first 2 years of the District’s 3 year proposal (as Keith Knauss predicted here). 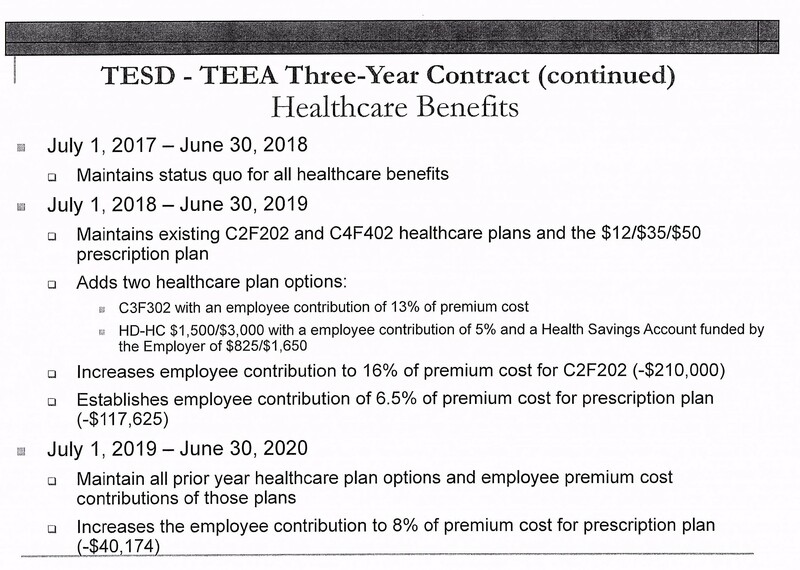 Salary freeze, no matrix movement, furlough days equivalent to 1% salary reduction in 2013/14, slightly higher contribution to healthcare premiums and prescription drugs, two new (lower cost?) health plans, capped tuition reimbursement, and one time $2,500 per employee bonus (a “legitimate” fund balance use?) in 2013/14. Net saving vs status quo/budget of $400,000 for the current year (2012/13); 2013/14 cost increases from that by $400,000 plus the $1.1 million one time bonus (but presumably a cost saving vs the status quo model). My general sense is that both sides went about as far as they could go this round. This contract is only for two years, at which point we’ll see how the economy and political landscapes have progressed, and the Board members Rich Brake, Kevin Buraks, Anne Crowley and Betsy Fadem will have had to choose their election platforms, if running in 2013. Interesting that the standard bonus helps those at the lower end of the scale more than proportionately (my concern, if teaching is to remain attractive for the next generation in an environment of benefits slashed in favor of the currently tenured), and that lead negotiator Deb Ciamacca keeps her higher-end CHS constituency happy by keeping the grievance on the table. The Finance Committee reported on the Act 1 index for 2013/14 – 1.7%. Slightly higher than expected – someone in the state bureaucracy (or government?) made a decision to change the calculation method (to include a longer period for averaging state weekly wage increases) that raises the index by 0.2%. Shenanigans? The Finance Committee spent some time discussing how to establish that parcels currently listed as tax-exempt conform with recent PA Supreme Court rulings that narrow the availability of tax exempt status. More details remain to be gathered on exactly what these rulings are and what entities might be affected. I was pleased to see that while Committee chair Fadem was advocating a 13 part, multi-point data request be sent to all tax exempt property owners (mainly the townships, federal government, schools, churches, right-of-way owners and land trusts), Board members Brake and Motel were at pains to avoid an “undue burden” on both volunteer charities and the district. The TESD held its regular monthly school board meeting last night. I was unable to attend but Ray Clarke attended and forwarded his notes from the meeting. 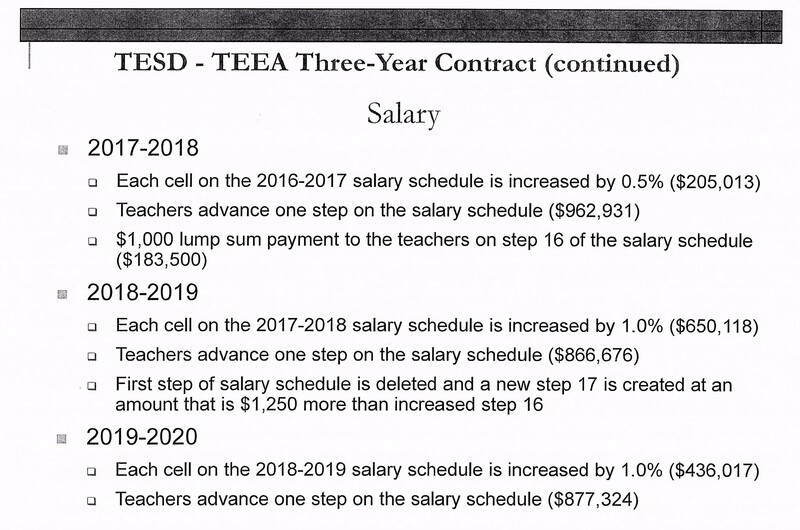 There had been much speculation about whether or not the public would see the tentative agreement between the District and the teachers union, TEEA. The agreement was not available last night but the residents were told that TEEA will vote to ratify the agreement by October 11. Therefore, as a result the school board has scheduled a special school board meeting for October 15 at 7 PM, before the previously scheduled Finance Committee meeting, which has now moved to 7:30 PM. Ray asked the board if the public would see the contract before the school board vote and they said it would be available at the meeting and the public would have a chance to comment before the vote. As Ray says in his notes, “We’ll have to do some speedy analysis in the allotted 30 minutes”. Ray’s questions to the school board were fielded by the solicitor, who offered “a lot of legalese about ‘labor relations case law’ and prejudicing the TEEA vote, while never explaining exactly how those factors would operate to adversely impact the district and its taxpayers”. I am pleased to know that school board member Rich Brake attempted a thoughtful explanation as to the rationale behind not providing the complete information at this point but with a commitment of a thorough explanation in the meeting before the vote. However, Ray writes, “Kevin Buraks, on the other hand, used the recent property purchase as an example of the need for the secrecy, which of course proves my point rather than his! That draft contract [Old Lancaster Rd. property purchase] – negotiated privately directly between the parties, of course was made available to the public a full week-end before the ratification vote”. If you recall last month, I was surprised to see the property purchase of the house on Old Lancaster on the school board agenda. Its agreed that there had been much discussion over the years about that remaining property and the need to purchase it – just came as a surprise and a little unsettling how the property purchase was seemingly buried in the bottom of the agenda. The agreement of sale identified the property as 892 Old Lancaster Avenue, the seller as the Estate of Arthur Fennimore, and the price as $265K. Ray’s noted the school board’s updated communications objectives for 2012-13 as including the communication of “milestones”, not substance. He reminds that it is this board of nine that “completely determines the budget, programs and taxes”. I was hopeful that the school district was moving forward in the direction of transparency but there certainly appears to be a sense of mystery surrounding the contents of the teachers’ agreement. My guess is that the school board believes in the ‘less is more’ approach when dealing with the public. Their theory appears to be the less that we [public] know, the less that we [public] can then question. Last night’s School Board meeting represented a distinct shift in attitude from the School Board directors in regards to the teacher negotiations. Since the District named their negotiating team last January (Dan Waters, Sue Tiede, Art McDonnell and professional negotiator attorney Jeffrey Sultanik), I have been very vocal in my concern that there was no school board director serving on the negotiating team. I was of the opinion that the residents of TESD elected the school board members to serve them and at least one of them needed to sit at the negotiating table. Without representation by a school board director, the reporting process had the appearance of a ‘whisper down the lane’. I understand that Sultanik was hired to negotiate at the direction of the School Board, but I think that the Board’s public appearance of ‘hands-off’ to the process, may have added to the strife with the teachers. The information and the updates that the school board receives were not by firsthand attendance at the meetings, the flow of information was from one of the four members of the negotiating team. I am not suggesting that the District intentionally mislead the public through its updates, but I was of the opinion that without a seat at the table, it was possible that subtle nuances that occur in a meeting could be missed in the translation. But here is some good news for anyone that shares my concerns with the negotiation process. At the end of last night’s meeting, Board president Karen Cruickshank gave a brief update on the status of the teacher contract talks. She explained the District has made another offer to the teachers and offered hope that a resolution could be forthcoming. 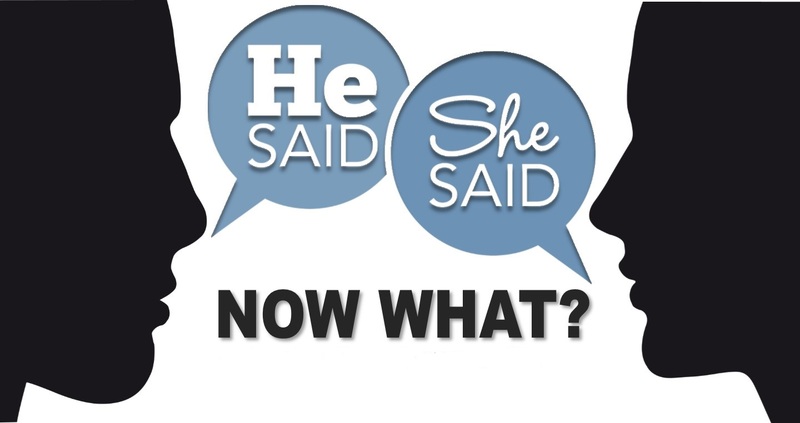 Not certain what is contained in the latest offer but there was something else … Cruickshank announced that going forward, school board directors would have a seat at the negotiating table. Karen Cruickshank, Pete Motel, Kevin Buraks and Betsy Fadem will join the negotiating team at all future meetings with the teachers union. I believe that this was the right decision for the District, the residents and for the teachers! The last few months have been contentious between the two sides, but I think this latest decision represents an encouraging sign. Given Our Economic Times, How Can T/E Afford A Real Estate Purchase? Here we are nine days and counting until school starts, in the midst of contentious teacher contract negotiations and parents in the District hoping that school starts on time. Residents have repeatedly been told that T/E School District cannot afford the demands of the teachers … escalating health care and pension costs. With decreasing revenues and rising costs, in June we witnessed, as tough decisions were required to balance the District budget. The agreement of sale that follows further identifies the property as 892 Old Lancaster Avenue, the seller as the Estate of Arthur Fennimore, and the price as $265K. The date of sale is left blank. On Saturday morning, I stopped by the property to take a photo and spoke with the grandson of Mr. Fennimore. He and his brothers were cleaning out the house in advance of the purchase by TESD. Mr. Fennimore was 97 when he passed away and was the original owner of the house. According to the grandson, closing between the Estate and TESD is expected by the end of the week. I have attended most, if not all, of the 2012 School Board meetings and have absolutely no recall on the discussion to purchase additional real estate property, … especially given the agonizing budget decisions, the possibility of demotion and the contract negotiations with the teachers. Therefore, I don’t think that I missed the discussion about purchasing additional real estate. This past Friday there was a Facilities Committee meeting and although I did not attend, according to the agenda there was no discussion about the upcoming purchase of the Fennimore property. To be clear, in the past, there have been on/off discussions about the maintenance building and the need to expand the storage facility. In fact, there are existing architectural plans — but as far as I knew, the project was ‘on hold’ for obvious economic reasons. The Fennimore house is the last remaining property between the current maintenance building and T/E Middle School on Old Lancaster Rd. – the District previously purchased all other properties. So … I guess from an overall planning standpoint, the acquisition of this property makes sense. 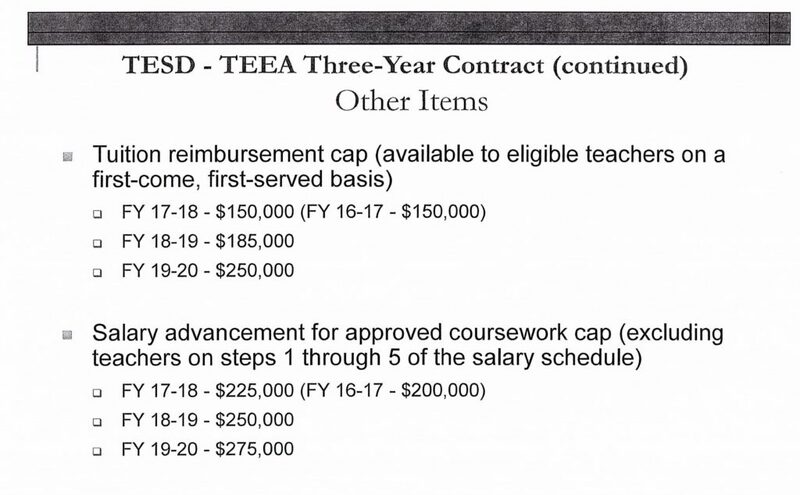 However, given the District’s current economic climate and the unsettled teachers’ contract, it would seem that the topic to ‘purchase’ would still require some discussion, not just buried with 20 other consent items. Unfortunately, the word that immediately comes to mind … transparency, or rather ‘lack thereof’. How did they arrive at the price for the property? The sale price is listed as $265K. 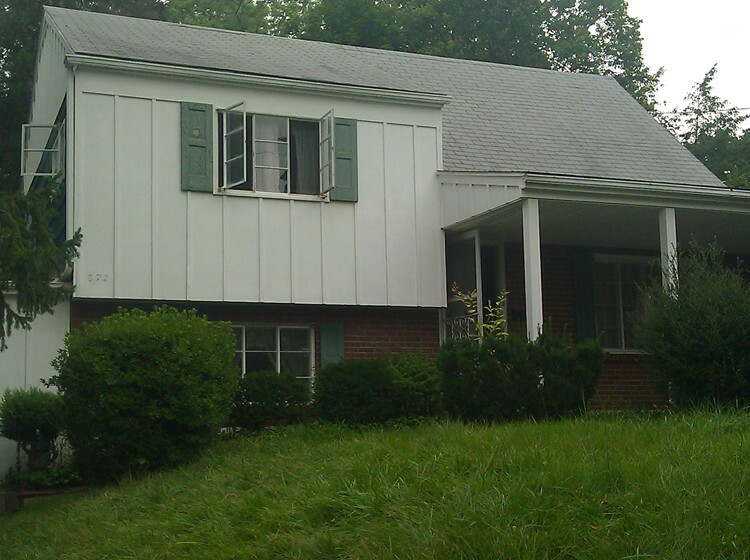 My friend Ray Clarke did the research and determined that the assessed value is $129,500. According to Ray, if we “… multiply $129,500 by the current Chester County Common Level Ratio of 1.70, you get $220,150.” Subtract $220,150 from $265K, and you have to ask, why is the School District paying a $45K premium for this property. Regardless of future development plans, for the time being, the District will need to tear down the house, which means an additional expense. Another question — is the maintenance-storage facility project still on the back burner or does the Fennimore house purchase have the timetable moved up on the construction project? Some may suggest that a $265K real estate purchase in the T/E School District is a ‘bargain’ and a ‘smart’ move for the District in these depressed economic times. But the bottom line for me, is $265K really such a bargain for a property assessed at $130K? And what about the public – do we deserve an explanation about the purchase? What is the plan for the acquisition? And if there is a plan, how much will that plan cost? I have the questions, but it doesn’t look like there will be much in the way of answers.